Solid golf contact doesn’t come naturally because you develop a smooth swing. It’s practiced and perfected, and it relies upon an understanding of technique and swing pattern. Most amateur golfers want to improve the contact they make will the golf ball so they can hit longer and more accurate shots. So in this lesson, we’re going to to teach you some quick golf swing tips that you can practice at the range and on the course to make better contact and hit more consistent shots. Pop quiz: should irons and drivers approach the golf ball at the same angle? 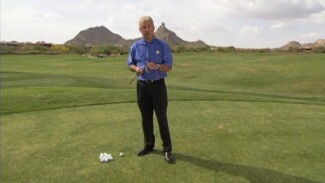 If you said yes, these golf swing tips from PGA Professional Mark Drenga are meant for you. Mark demonstrates the reason why so many amateur golfers can’t seem to lower their scores any further — the reason being that they make the same contact with their irons as they do their driver. To help you develop a more solid impact with the golf ball and become a more consistent player, Mark teaches you some expert golf swing tips and shows you how to complete a basic golf swing mechanics exercise called the Towel Drill. Using a single golf towel, you’ll discover the difference between solid contact with an iron and solid contact with a driver, and learn the basics of swing shape. In demonstrating the Towel Drill, Mark explains why, when swinging an iron, you should first make contact with the ball, and then the ground, so you’re approaching it on the downswing to utilize the angled face of the club. He then explains why, conversely, you should hit the ball with your driver on the upswing. If you take advantage of Mark’s simple golf swing tips and add one of his essential practice drills to your training regimen, we guarantee you’ll start hitting the ball farther and with more accuracy, shot after shot!